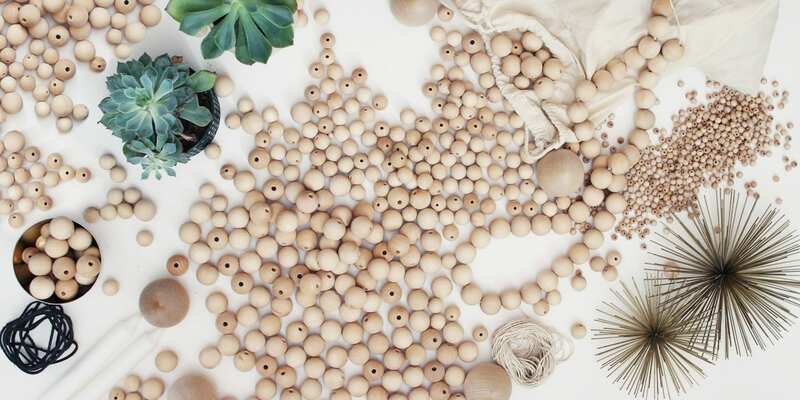 This November we are getting creative with natural, raw wooden beads for all sorts of making. We've created a kit with over 1000 wooden beads ranging from tiny jewelry-sized beads to doorknob-sized chunky beads for lots of exploring. Our kit this month includes several stringing options (from cotton string to leather cording) and customized larger wooden beads to fit candles for more unique making. Lynn Muir is sharing with us a variety of Scandinavian-inspired designs that are especially perfect for the holidays but that really make simple, beautiful additions to the home year round: garland, tablescapes, candleholders, trivets, wreathes, ornaments, napkin rings, wall hangings... so many ideas to explore. New members are welcome to join us between October 10-20th to enroll in this workshop, current members are already in. We are excited to collaborate again with our husband & wife carpentry team to customize the larger beads in this kit as well as for our add-on kit. More about our artist: Lynn Muir has grown up her entire life around wood and carpentry. She's well known for creating unique wooden pieces of art and is at her heart a crafter and entrepreneur. Originally from Seattle, she now lives in Lindon, Utah with her husband and their 3 children. Lynn and her husband have been entrepreneurs for the last 11 years, currently owning and operating 4 small businesses. She thrives off of the creativity and adventure that being self employed brings. Lynn blogs at pocketfulofpaint.com.